Peace Massage Oil is the perfect massage oil for night-time or for anyone who suffers from extreme stress, has trouble sleeping or just needs to calm down from a busy day. Formulated by a qualified aromatherapist with relaxation and sleep in mind, this massage oil helps to soothe and calm. It is popular with massage therapists looking for a massage oil for their most tense and stressed clients and is also perfect to use at home to help get you ready for a peaceful nights sleep. 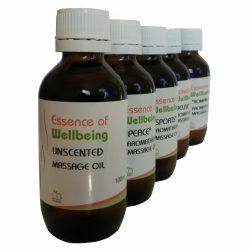 Essence of Wellbeing Peace Aromatherapy Massage Oil is a unique massage oil blend with the aromatic and therapeutic qualities of lavender, marjoram, sweet orange and ylang ylang essential oils, blended into a natural base of grapeseed, sweet almond and macadamia nut vegetable oils. (It also contains rosemary leaf extract, an anti-oxidant, to help lengthen shelf life). These essential oils have been selected for their relaxing calming and sedative properties to make this the perfect “de-stress” massage oil for the end of a hectic day. Directions for use: Pour an appropriate amount of oil in your palm; rub both palms together to warm the massage oil before applying to your skin. Then massage into the skin using smooth flowing motions. Our Peace Aromatherapy Massage Oil will leave your or your clients feeling serene and relaxed.